A regular customer, who frequents my pushcart in Clarke Quay and booth when I was busking in Orchard Road. 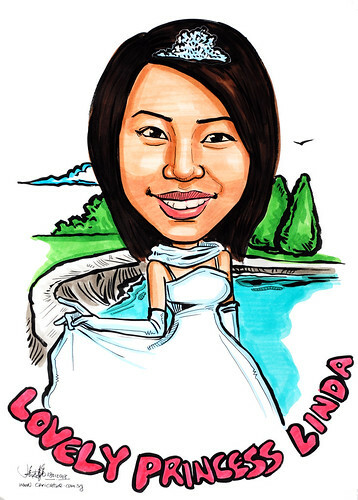 He gets me to do caricatures for his girlfriends (not concurrently, of course) on any occasions, usually for birthdays, anniversaries, Christmas Day and Valentine's Day. He will tell his friends what he wants for his birthday presents beforehand. He will instruct them to come and look for me to draw caricatures of his friends and him. That was what his friends told me. Hahaha.... Thank you, Jason. This time he's featuring this girl as a lovely princess. Sent me the photos of dress and posture he wanted. I added in the background that appeared in the photo. Didn't colour right to the edge of the drawing. Think it looked better in this way. More sleek.